The morning began with a Jericho Walk around Routh Street abortion center, with Bishop Mark Seitz, Vicar for Clergy Msgr. Greg Kelly, and Fr. Kyle Walterscheid of the University of North Texas joining in prayer. 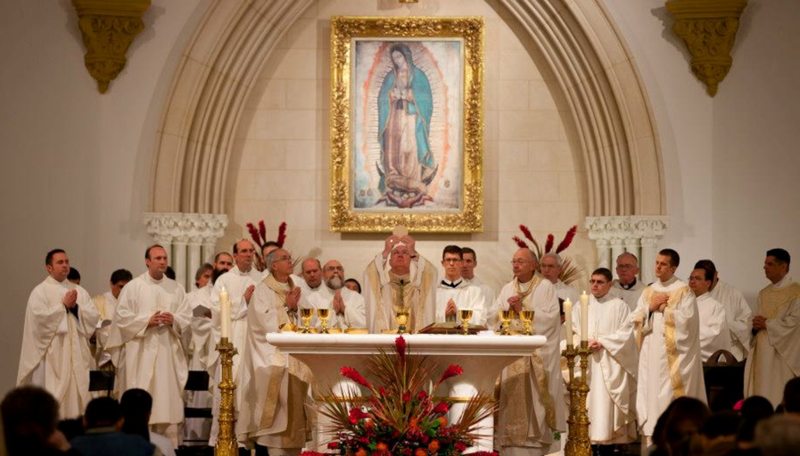 Following the rosary, the Roe Memorial Mass, attended by over 3,000 (overflowing into the Grand Salon and the Cathedral Plaza), was concelebrated by Bishops Kevin Farrell, Doug Deshotel and Mark Seitz and diocesan clergy. Fr. Zach Webb delivered the homily, reminding us that changing the law is not enough; we must devote ourselves to converting hearts through God’s love to embrace life. 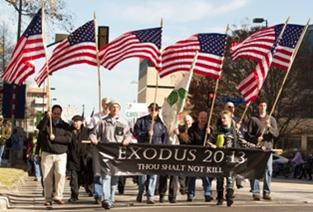 After Mass, and a parallel worship service at First Baptist, over 10,000 people took to the streets to March for Life and rally outside the Earle Cabell federal courthouse where Roe was first filed in 1970. During the Rally, Bishop Farrell challenged attendees to be activists not just on the anniversary of Roe v. Wade, but throughout the year. Bishop Farrell’s call to action was followed by the inspirational words of Richard Ellis, radio host and Reunion Church pastor; New Wave Feminists founder Destiny Herndon-De La Rosa; Chris Wheel of the Fatherhood Ministry at Oak Cliff Bible Fellowship; and Fr. James Flynn of the Fort Worth Diocese, plus the powerful testimony of abortion survivor Angela Martinez Balderaz. Visit prolifedallas.org/roe to view pictures and video of the day’s events. And be sure to save the date for the 2014 Roe Memorial Events on January 18. Bishop Farrell has decided that the 2014 Roe Memorial Mass will be held in the Dallas Convention Center to accommodate the ever-growing crowd!